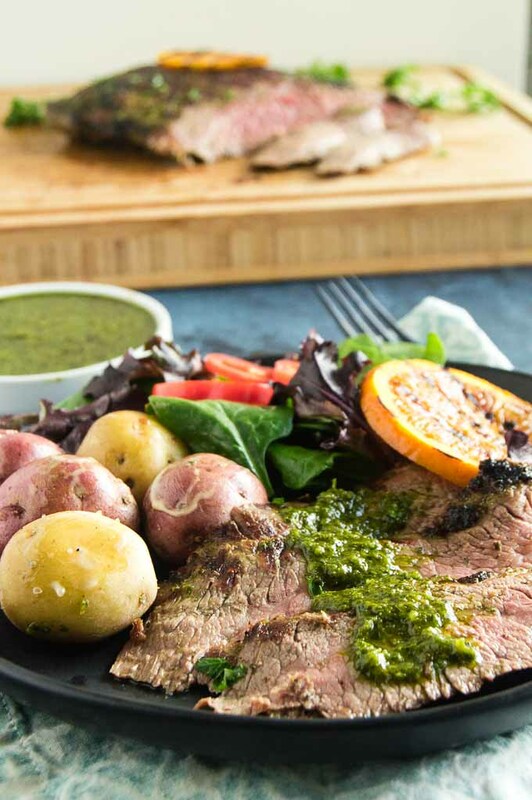 Grilled Chimichurri Steak, an authentic Argentinian recipe which uses a 5 minute simple sauce-marinade made of fresh herbs, garlic, lemon juice and olive oil. Marinate for concentrated flavor or brush on as its grilling! 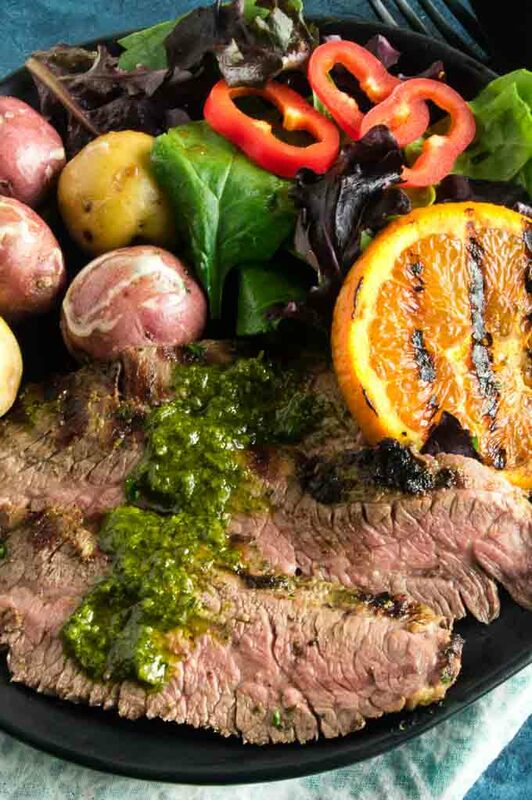 Grilling Season is just around the corner and nothing is easier than todays recipe for Grilled Chimichurri Steak. Chimichurri is from South America, most often thought from Argentina. It is a super versatile sauce that can go on anything. I have made it with Grilled Shrimp here. It’s as common in South America to have a chimichurri sauce on the table as it is in the US to have BBQ sauce or Ketchup. Fresh bold herb and citrus flavor in olive oil that you can add a little heat too with chili flakes if you want. In Argentina they consider it more of an herb salsa. It can be made with many variations but the most common variation is Cilantro, Parsley, garlic, onions, vinegar and some citrus with olive oil. 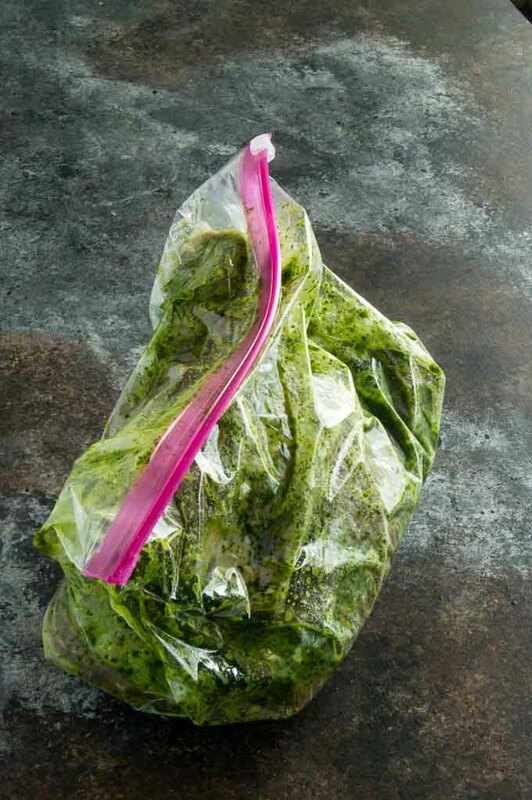 The trick to chimichurri is to not puree the sauce. You want the flakes of the herbs and larger bits of onions and garlic. What is the best way to make Chimichurri? Before you begin you will want to pull by hand the leaves of the herbs from the stems. Nothing is worse than getting a bitter tasting stem in your bite of salsa. A few stems are ok, but do your best to remove them all. You can use a food processor or cut the ingredients with a knife. If you are using a food processor (which I do) you will have to pulse, not let the machine run constantly. Remember you dont want a puree, you want more of a salsa with full pieces of the ingredients visible. What steak is the best for Grilled Chimichurri Steak? There are two cuts of meat that will work very well with this recipe; flank steak or skirt steak. Both are very economical and a great option to be able to make a delicious meal to entertain within a budget without breaking the bank. 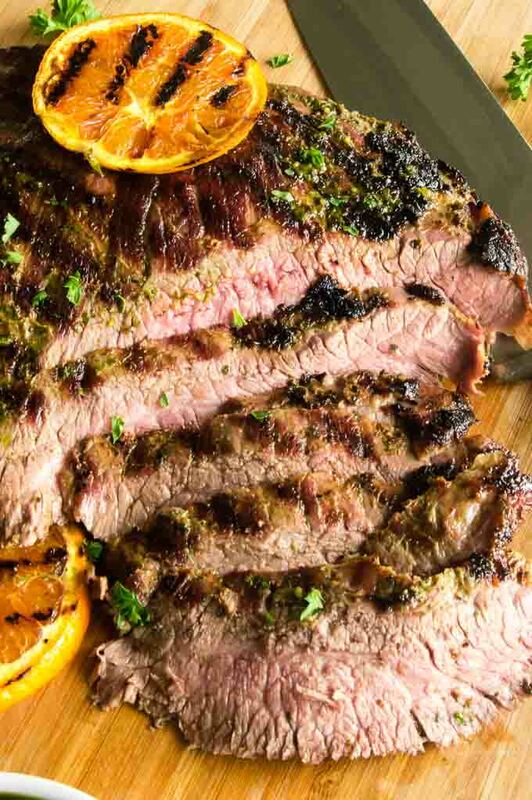 What is the difference between flank steak and skirt steak? Both cuts of meat are from the same area. A flank steak is cut a little thicker by the butcher and is leaner than a skirt steak. A skirt steak is thinner but has more fat, which also is a plus when grilling because you can cook it quickly at a high temp, and the fat forms a beautiful crust from the grill. 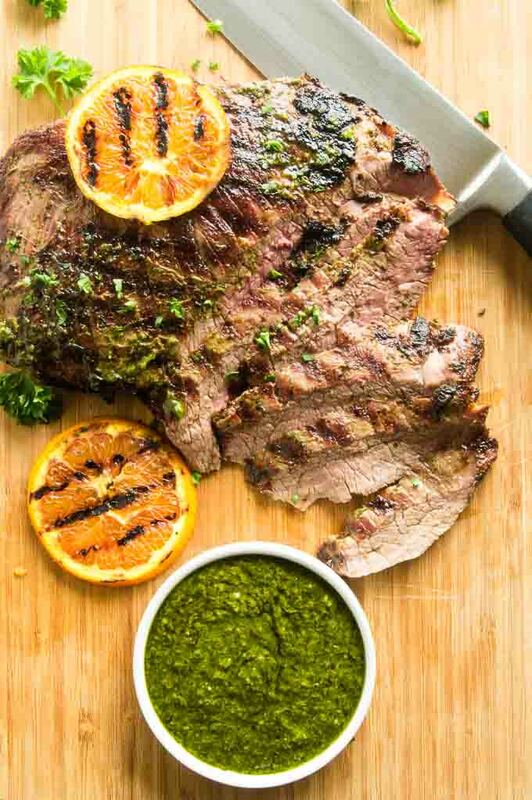 I tend to grill whether its hot or cold out, but if you don’t have a grill or would like an option to cook the flank steak / skirt steak chimichurri in the oven there is a great video tutorial on the kitchen here. There are two things that are very important when using either a flank steak or a skirt to avoid it becoming tough and dry. Dont overcook it. Cook it to no more than medium temperature, ideally more to medium rare for a juicy cut. Cut the meat 1/4 ” thick across the grain to keep it nice and tender. To know what way the grain is you can look at it and see. You will want to cut across (not parallel to the grain you see.). What else can you use Chimichurri Sauce for? Stir 1/4 cup into cooked pasta or cooked rice right before serving for a fresh side dish. Use the sauce as a salad dressing. Any other grilled meats, especially chicken or shrimp. If you are looking for other Grilling recipes these are always popular! Pin this recipe to your Grilling Board or your FOOD TO MAKE FOR A CROWD board! 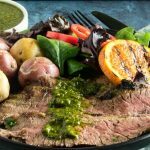 Grilled Chimichurri Steak, an authentic Argentinian recipe which uses a 5 minute simple sauce-marinade from made of fresh herbs, garlic, lemon juice and olive oil. Marinate for concentrated flavor or brush on as its grilling! Place the vinegar, salt, garlic and onion in the cuisinart. Pulse until garlic and onion are finely minced. Let all those flavors meld together. While they vinegar mixture is resting, rinse the cilantro and parsley and pull the leaves off of each bunch. A few stems are fine, but cutting off the bottoms and pulling most of the leaves will get the best results. Add cilantro and parsley to cuisinart and mix for 2 minutes until fine. Add lemon juice, lemon rind and red pepper flakes and pulse for another minute. Slowly add olive oil, running cuisinart until well combined. If sauce is a little thicker than you like it, add water one tablespoon at a time, whirling food processor to blend well and check the consistency. Transfer to a container to store in fridge for at least 3 hours before serving. Can be stored in an airtight container for up to a week. 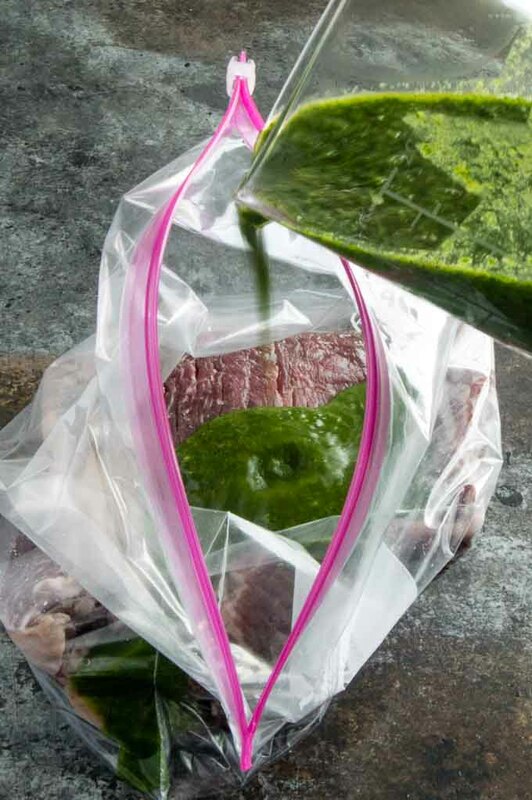 Optional, you can place steak in a plastic bag. and marinate with 1/2 cup chimichurri sauce for 1 hour up to overnight . Turn on grill to high heat. Let get hot for 10 minutes. (If using a charcoal grill, allow coals to be fully hot and flaming. While grill is getting hot, remove steak from plastic bag (if marinating) or from packaging and season with salt and pepper generously. Once grill is hot place steak on the grill and cook until your desired doneness. It is recommended that both of these cuts of meat cook no more than medium rare to avoid toughness and being dried out. Every grill is different, our grill cooked the meat for 5 minutes on the first side, 4 on the second side and was a perfect medium rare. The meat will char slightly on the high heat which will give a great flavor. When meat comes off the grill place on a plate and allow to rest for 10 minutes. Slice meat 1/4" thick across the grain for the most tender cut. Spoon chimichurri sauce over the top and serve immediately. This recipe yields about 2 cups of Chimichurri Sauce. The calories account for 2 tablespoons per serving. The calorie count will vary depending on how much sauce you use. I have not made chimichurri sauce myself, but I have eaten it when we dined out, and I love it. This pictures are so mouthwateringly delicious, I simply HAVE to make it now!! What a gorgeous meal! I was just thinking about making chimichurri sauce! I’ll have to give this recipe a try! I always love your posts because they give me little nuggets of information that make my life in the kitchen so much easier! I never knew the difference in the skirt steak and the flank steak but now I do! And now I am craving either one right now! The grill is unpacked and ready to go so this is on the menu this week! That looks delicious and cooked just perfectly. That Chimichurri sauce would definitely add a nice bright flavor as well as looking so fresh too. This is the best sauce ever and it can be used on so many foods! We love it on shrimp. Cilantro and parsley are the only herbs that thrive year round in my little garden, so they’re always available. Freezing batches so I can just pop them in dishes anytime with ease. Thank you! Chimichurri is my FAVORITE sauce in the WORLD! Such a great topping for steak. I also use it to make salad dressing, and as a dip for bread. SO good! Chimichurri is one of my favorite sauces/condiments. I seriously can pour it over anything and be happy! It goes so well with so many things – especially steak! This recipe is excellent and that steal looks amazing and perfectly cooked. Thanks for sharing! This is the perfect use for all my garden cilantro and parsley! I love having fresh recipes to make with my herbs – especially tasty ones! Oh my goodness this steak looks SO delicious and juicy! The chimichurri sauce sounds so good. And such a quick dinner to create for a weeknight. I’m pinning this for later!